Fast, efficient, practical. A lowracer for daily use and big trips alike. The Fuego is a popular bike in the UK, one championed by David Gardiner of Laid Back Bikes, who lent me this demo (often used as his own means of transport). With a seat height of around 35cm (but see David Gardiner’s comment), reclining down to 25 degrees, the Fuego is a fairly low, but by no means extreme model. In fact it was one of the first I tried- some years ago with a bike to work voucher burning a hole in my pocket! This easy accessibility to complete beginners, combined with comfort and great versatility at not too great a price is what makes the bike a compelling proposition. Of course, the relatively low seat height and reclined position (the seat goes down to 25 degrees) keep the experienced rider equally happy. You can spend more and buy a lighter bike, a faster bike, a higher (or lower!) bike. But many people don’t, and it’s not too hard to see why this all-rounder wins them over. With rear coil suspension and Kojak tyres, the Fuego is very comfortable while giving up little in the speed stakes. The fastest riders may wish for a rigid frame, but to be honest I found it hard to remember I wasn’t until I got onto rough terrain! The connoisseur may feel the small front wheel suffering a little on very rough ground, but this is largely mitigated by the choice of tyre and overall, the benefits in terms of getting normal-leg-length riders into a very aero position are unarguable. On one 55 mile test ride around the Pentlands, I was able to average 16.5mph despite a couple of respectable climbs and a frustrating headwind. Not bad as I’m so far out of shape. Steering is precise without being nervous and the bike’s turning circle is unencumbered by any conflict with the chain, which is lifted. This makes it easy to handle on so-called cycle “facilities” or filtering in town (I spent a few days commuting through central Edinburgh to put this to the test). 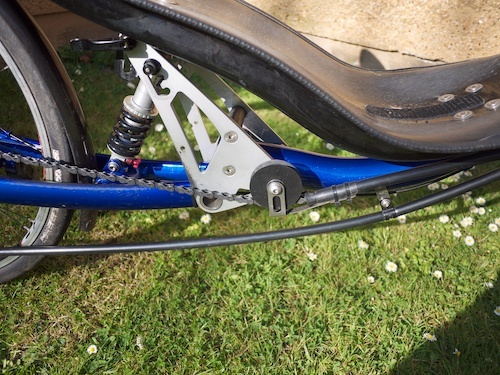 The suspended rear end has superb traction as you’d expect, staying planted on really rough ground both powering and braking (like most recumbents, the bike is inherently predisposed to lock the rear wheel). At 25 degrees, it’s not hard to maintain good situational awareness and the bike is very easy to ride one-handed for the purposes of taking photos, drinking, signalling and so on. I can’t ride any bike no-hands, so no comment there! The Fuego features Nazca’s characteristic split frame to accommodate suspension (coil as standard, air shock available as an upgrade). Aesthetically, opinions on this are doubtless mixed – the aluminium plates on the Fuego are big and bold compared with Challenge who often conceal the pivot in a continuing line of the frame (see the Furai rollover on this page). You may prefer one or the other – I don’t personally mind either way. 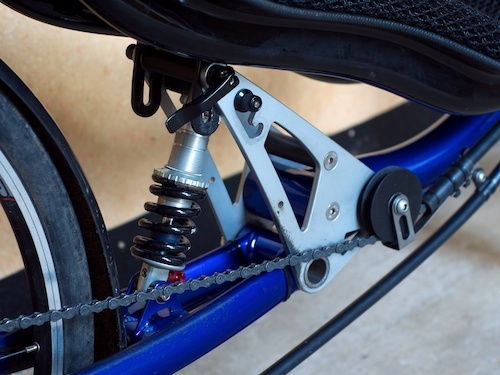 As a more practical low bike (especially as a low tourer) the suspension has a lot to be said for it – keeping stresses on the bike and luggage, not to mention the rider, lower than is otherwise possible. Comparing the complete assembly with a simple tube frame, you can see the weight penalty inherent in a suspension bike (which seems to be on the order of a water bottle or two) – but it’s only fair to point out that 95% of riders could easily lose that much from their paunch before worrying about the weight consequences of their particular bike! Riding the bike, I wasn’t able to distinguish any suspension bob when powering hard, although a lab would surely be able to measure it. This really highlights the adjustability of the Nazca Fuego- other bikes take minutes (and tools) to adjust while I was actually able to finish a climb, undo the seat QR while gaining on a roadie to drop five degrees, do it up and scream past on the flat. Sadly you can’t do it the other way around without dismounting! The Fuego comes with a rack fitted to the seat back which is rated by Nazca at 7kg. 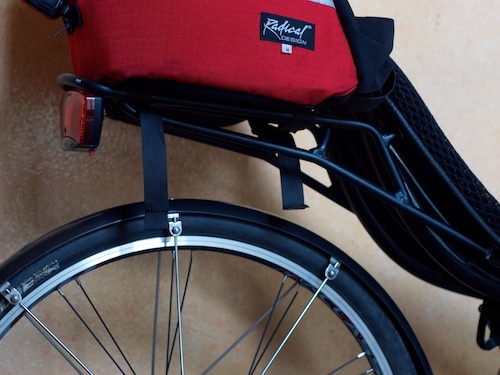 Unlike the Challenge day rack, there are no side supports so you can’t fit a conventional pannier. Unlike the Challenge Furai, however, you can fit the Nazca Fuego with a heavier duty touring rack – in addition to the “day rack” as demoed – and this will accommodate full-size panniers up to 30kg (15kg per side). You could combine all of this with modest side-panniers – in fact, as an alternative to the heavy rack Nazca supply a side-pannier support bracket to avoid the paint-rubbing experience I had on the Furai. All in all, it’s hard to think of a bike so low that can be equipped to carry so much, although it’s a shame that the basic rack won’t support panniers like the Challenge day rack does. The Fuego has a triple chainset to give a broad range of gears – the exact model depends on the version you go for, with the sport featuring Tiagra, the top-sport 105. 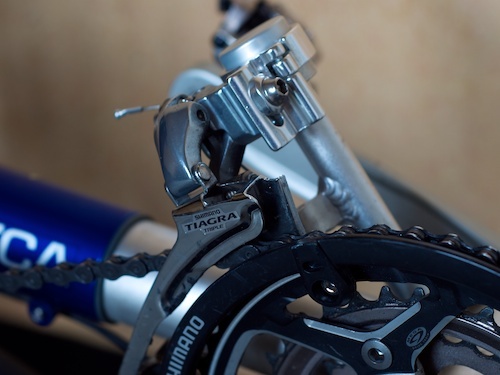 A little weight could be saved by fitting a double, perhaps, but it isn’t much and would mean losing a chunk of gear range or accepting giant steps between gears. The weight of the smallest ring is seriously tiny. 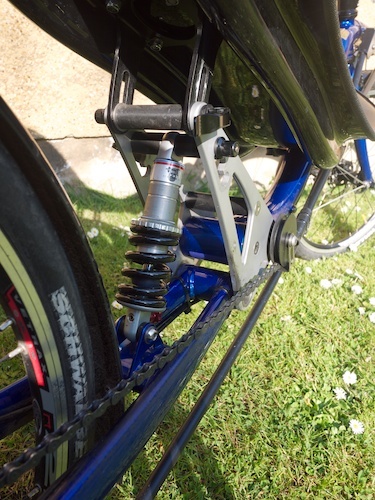 The shift motion was fairly stiff, but the bike did change quickly and precisely between all three rings on demand, and with gripshift there’s no possibility of the mech rubbing. 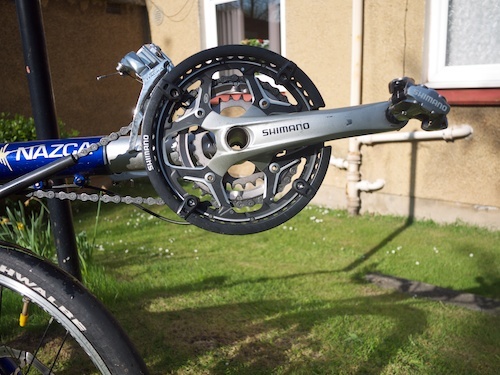 The minimalist derailleur post is nice – with a regular size drivewheel there’s no question of needing the ~70t drivewheel of a Raptobike so there’s less need to allow the mech to sit at widely different positions on the post. 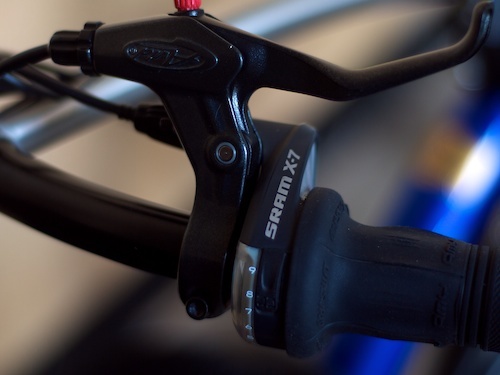 I assume it does preclude the use of Terracycle-style adapters that fit on normal diameter derailleur posts (for fitting lights), but not to worry – Nazca can supply a fitting for the front of the boom that takes a regular handlebar light with no issues whatsoever. 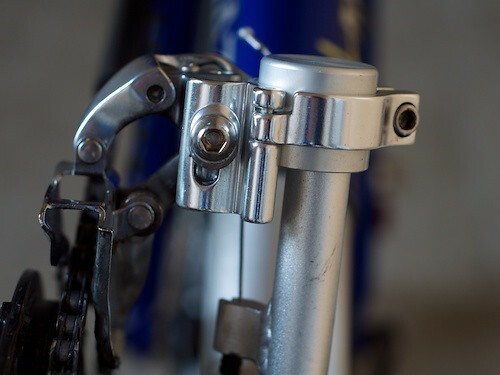 Without the adapter, a standard dynamo light will screw on securely. Chain tubes feature on both sides of the chain, and this combined with the excellent idler cover (something I complained about in my Furai review, for instance), there’s small chance of getting oily. 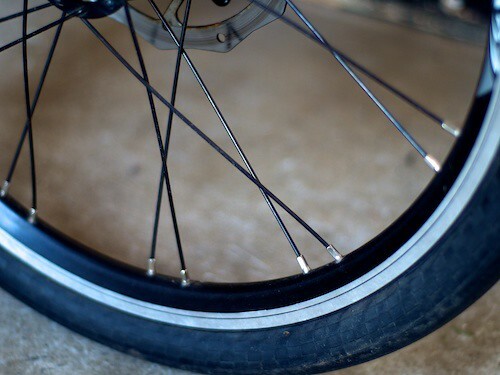 If utmost efficiency is a priority, you could certainly put protective tape on the fork and run the chain bare. 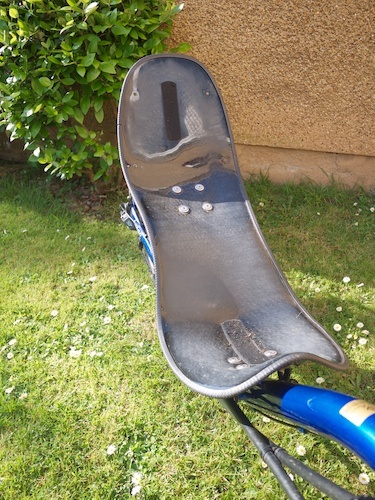 The seat, in this case, is a standard glassfibre hardshell. ‘Standard’ of course just means it isn’t made of weight-saving carbon fibre – this is still a serious improvement if you’re used to mesh seating. The Ventisit pad provided excellent ventilation and comfort – it’s pretty much the industry standard, although it’s worth noting it’s fairly heavy in comparison with foam pads, in exchange for keeping your back fresh and comfy. In this configuration, the Fuego is equipped with SRAM X7 shifters and Avid Speed Dial 7’s. 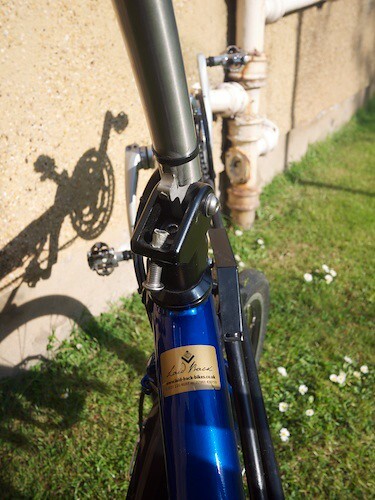 The brake levers are particularly good, as they offer reach adjust in addition to the usual barrel adjuster – great for getting things just as you like them. As with the Challenge Furai, cables are routed internally through the stem, although in this case, rather than the rear brake suffering, I found the front mech to be stiff – I wasn’t able to determine the cause and it was perfectly useable, just had a much stiffer feel than the other shifter. 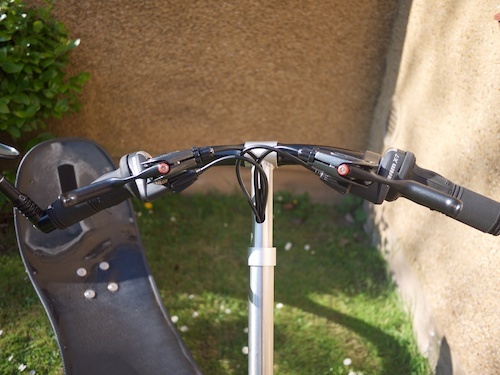 These are the same bars as fitted to the Nazca Gaucho, and it’s interesting that I thought them wide and ponderous when I first tried that bike (see my review of the excellent Nazca Gaucho), because this time around, I didn’t have such a bad view of them! To be fair, I think I may just be a bit weird with hand positioning, as I found myself quite often resting my hands on the bar either side of the stem, not on the grips at all! The superficial similarity to Challenge ends at the frame, where the cables run externally, rather than inside the main tube. Each arrangement has pros and cons, but here one criticism of the Fuego that I would offer is the lack of little cable guides on the frame above the fork, as you might find on a Raptobike. This means that the cables had a tendency to be quite wide of the left of the frame, brushing against my leg. 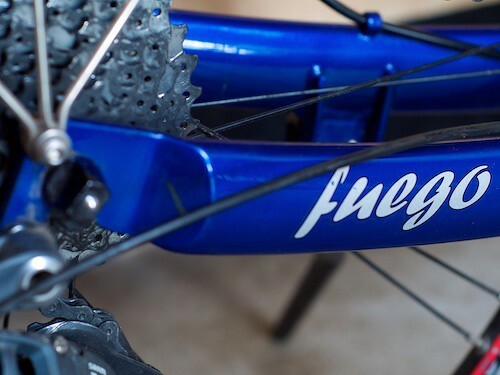 The entry-level Fuego comes with standard wheels – but on the Sport and Top-Sport models, these are upgraded to low spoke count versions with an attractive paired-spoke lacing pattern. With mudguards fitted, I’m not absolutely convinced of the benefit of low spoke wheels but at the same time, every little helps and they do add to the bike’s racing pedigree. If you’re worried about sturdiness, it’s noteworthy that this bike has been ridden for quite some time around central Edinburgh, has disc brakes (certain, we’re told by bike luddites on the internet, to lead to wheel failure!) but both were as tight and true as you’d expect from a brand new bike. I wouldn’t choose them for a touring version of the bike (and Nazca probably wouldn’t recommend them for that anyway) but other than that, they seem like a nice upgrade. At both ends, braking is provided by the ever-excellent Avid BB7. The more I use these, the more I think they’re better (all things taken into consideration) than my Elixir and Juicy hydraulics. 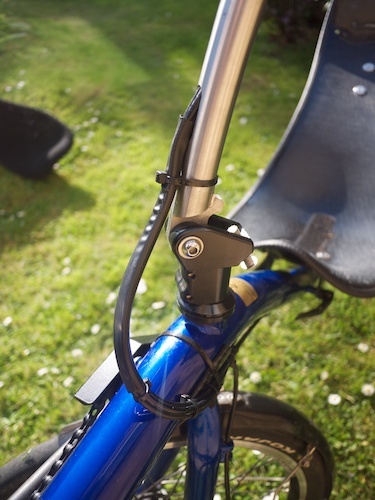 A quality kickstand was fitted (hurrah!) and this kept the Fuego stable and upright for shopping, photo opportunities, and will help keep the paint nice if regularly locking up to a bike rack. The Raptobike has a very similar wheelbase and steering geometry to the Fuego, but whilst the bottom brackets are at a similar absolute height, the Raptobike has a much larger seat / bottom bracket delta (24cm VS 16cm on the Fuego) making for a very different seating experience. 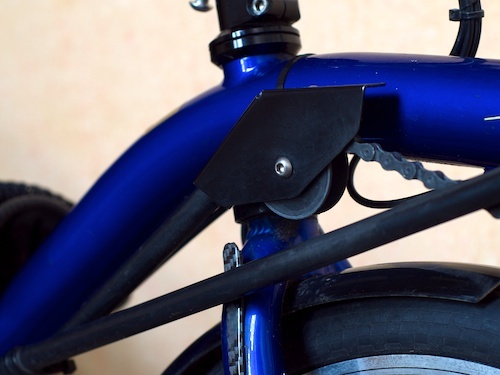 The Raptobike has the edge in aero terms by fitting more of the rider’s body behind the legs for the same seat angle, and is also lighter by virtue of its rigid frame. However, the Fuego is significantly more comfortable and enormously more capable in the load-carrying stakes. Configured similarly (double chainset and front disk brake) the Raptobike costs broadly the same as the Fuego. The Furai is an interesting comparison with the Fuego – both have suspension, both are sold in stock configuration as day bikes or light tourers. On balance, the finish quality on the Challenge bike feels better (despite, for instance, having an X5 rather than X7 groupset) while the Fuego is the bike I would trust for longevity and load carrying (although at no point did I feel like I might break the Furai). The Fuego definitely has the edge in terms of aerodynamics (it feels considerably more efficient once speeds get above 20mph) but the Furai has a clear advantage on rough terrain – I mean literally unpaved surfaces – by virtue of its larger front wheel. On tarmac roads in sustained poor condition, I’d say these two factors broadly cancel out. The Furai costs significantly, though not drastically more than the Fuego. Here you can see Nazca’s own Gaucho 28″ race bike. (The Gaucho is also made in a variety of day trip / touring configurations, but this isn’t one of them). Although there are similarities between the bikes – the steerer/bars, boom, maybe even the chainstays, with carbon upgrades and skinny racing wheels there’s not much direct overlap. I wanted to include this more just to give an illustration of the different riding positions – the Fuego down low and the Gaucho up high (especially dramatic in the jump from bottom bracket to ground, each time you want to stop). I wouldn’t like to say which is faster – probably the Gaucho as it has the advantage of weight and great finishing kit, but I’d be surprised if there was a huge difference, with the Fuego having the clear aero advantage. 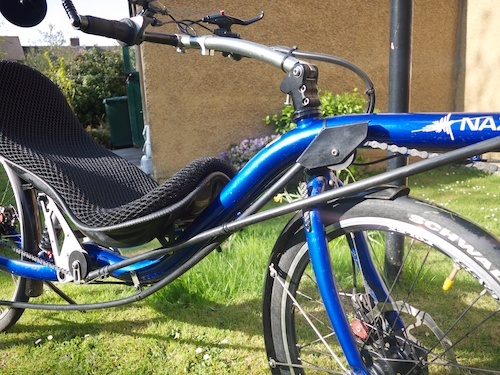 The Fuego is well worth a look if you’re in the market for a recumbent that will be fast and exciting without being crazy (or crazily expensive! ), especially if versatility and all-weather riding is important to you. The sturdy build quality and predictable handling also make it ideal for those who picture themselves bashing over cratered moonscapes or playing in rush hour traffic. David Gardiner almost always has a Fuego in for demos and I’d encourage interested parties to get in touch if they fancy dropping in to the central Edinburgh showroom of Laid-Back-Bikes. Great write up of the Fuego and comparison of the various bikes you’ve had the pleasure to ride. I too have a Raptobike but have always lusted after the Fuego, especially after reading a previous report on their handling. This I feel is more important than anything. I wouldn’t want to back off down a lovely winding decent just because a bike feels insecure. I still think the Rapto has the style but you don’t see it when you’re riding and at the end of a loooong ride (PBP) any discomforts would end up in agony. Groan! Australia is too far away from civilisation. Finally managed to read this review…. after the previous ones here I knew it would be thorough and covering the stuff that you notice when you have ridden more than a couple of bikes. Worth noting is the fact the Fuego comes in two frame sizes. The medium frame (body size 160 – 185 cm) reviewed here is slightly higher than the large (body size 175 – 200 cm). Nazca state 39cm for medium seat height and 35cm for large. Yes.. you heard right the medium is higher and the larger is lower. I’m 1.9m so can try either but keep a medium as more people can try. If you choose a large you can handstand a bit easier – like a Rapto LR. Upside of the medium is that your feet are well out of front wheel zone and it still is spacious enough to feel good. It’s almost a midracer in some people’s books (ie Optima). if you are a smaller rider then shorter cranks can let you use this bike as boom has big range of adjust. Also like to point out that the power side idler is not the normal one fitted but in fact a Flevobike return idler. Latest one has teeth and harder wearing – not sure if Dave would be faster using it but can get an update out when the new bikes arrive. Seat sizes come in M, L and XL. Lastly (for moment) the bike is easy to park and handle as the rear rack has a handle exactly where you want to pick it up. To turn in narrow space you can get it up onto back wheel and it’s quite neat to turn. The stand can be flicked down with one foot as it’s very neat. All my Fuegos have been on trains a lot and never had any problem fitting them. Enjoyed the write up. I borrowed this bike for a week last year and it convinced me to buy a Fuego. Mine has the 24 spoke wheels, 30 speed Shimano XT throughout with rapidfire shifters and a carbon seat. It saves a little weight and works superbly. The 30 speed setup closes up the ratios quite nicely. A superb bike and my allround favourite – and I’ve had a few! Interesting review- I bought a Fuego a few months ago to have something a bit sportier and lighter than my Street Machine. Unfortunately I made the mistake of buying some digital hanging scales the other day and actually found the Fuego weighed more than the Street Machine! And my Fuego is the *Sport *model which is listed as weighing around 15 kg- actually it weighs 19.50 Kg or 43 pounds! No wonder I found it hard work up the hills! The Street Machine complete with pedals,mudguards,seat and marathon plus tyres and dual drive hub and spring suspension comes in at 19.20 kg!. By spending about £100 on a super light chain and another £100 on a superlight rear cassette ,I have now managed to get the Fuego down to about the same weight as the Street Machine ! For some reason both Nazca and HP Velotechnic give completely misleading weights for their products ! Actually I found the Fuego frame alone without wheels but with chain came in at about 15KG on its own! 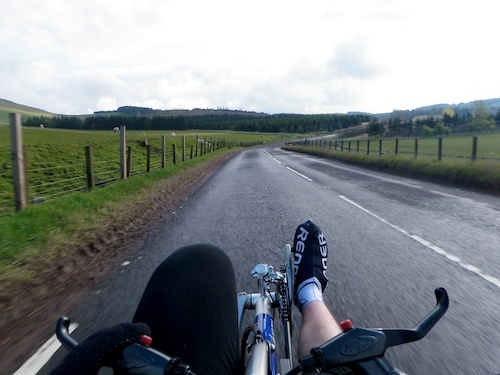 This is the main drawback to “comfortable” recumbents -they weigh a ton! Not a problem in Holland but a different story in the Borders! I agree with your point about the very stiff front gear shifting on the Fuego-in fact it made me wobble around so much trying to get into the largest chain ring that I changed to thumb shifters for the front which are a lot easier but not very accurate. 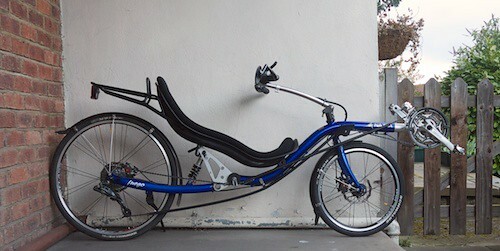 Still waiting for the ideal recumbent! John, I read your comment with interest and rushed out to weigh mine! Mine is a medium, carbon seat, 10 speed XT, Rapidfire and 24 spoke Kojak shod wheelset. With computer, GPS bracket, bottle cage, headrest, pedals and Ventisit comfort pad i.e. ready for the road it weighs 16.2 kg. When the current one is worn out I will fit a SL chain and some better quality lighter pedals but as it is I find it quite lively and fast. The Fuego’s great merit is for me a really engaging ride. I always look forward to riding it and it it is my first choice bike. I have this notion that, unlike conventional bikes, weight is a less significant factor on a ‘bent. Other factors such as BB position etc are as important. I’m talking from the point of view of a tourist and recreational rider. Might be different if I raced! I forgot to add – I experience no stiffness with the Rapidfire shifters. Good shifts every time. Back in my Bacchetta days however I found the lower end SRAM twistgrips fairly horrible yet the higher end (X9 / X0) were great! I have recently purchased this actual Fuego that was reviewed here from David Gardiner at Laidback bikes – great service here. I previously had a Challenge Fujin. I much prefer the Fuego. Yes it is no lightweight (nether was the standard Fujin model). 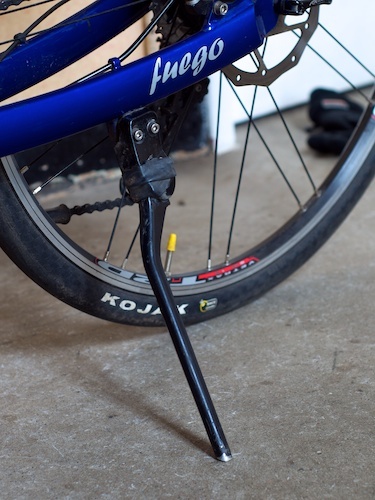 It is very flexible and easy to change seat heit and angle – QRs allow this with ease. Dave McCraw has done some interesting analysis on weight of bikes and actually suggesting that weight and efficiency of a rider will have greater impact on overall speed and times. What I would say is that the Fuego is a very comfortable, stable and predictable ride especially compared to the Fujn. The Fuego is no slouch – I recently managed 47mph on a long downhill section in West Lothian Alps. The only thing I would change as an upgrade would be air suspension so that this could be firmed up if alot of climbing was involved – it is more bouncy than my Fujin (though that could also be down to oldish suspension on the Fujin). I have had no problems with the gripshift. This bike has given me much pleasure in the last couple of months and I did the Etape Caledonia on it – I was comfortably able to ride the next day with little stiffness or ill effects – testament to the comfort of the Fuego. On the weight issue – the sheet says circa 15kg, that will probably exclude pedals and seat pad (at least, most manufacturers seem to measure this way). If you add a touring rack, I suppose there could be another kilo of metal and fittings there? I deliberately don’t weigh them for these reviews because I don’t think a kilo here or there is that important out of the overall rider+luggage+bike weight, but maybe I should start (just to see if the stated figure is accurate). Yes ,I agree a kilo here or there isn’t a big deal but I think 4 kg is!- makes it about double the weight of a road bike! Weight does become an issue when you start getting into over 40 pound machines-at least for my ageing slightly knackered 65 year old engine. When I weighed my Fuego on bathroom scales it also seemed to come out at about 16.5 kg- but I think bathroom scales are not very accurate in that one has to balance the bike somehow on the scales and to stop it moving around, it needs holding which affects the reading. All I know is that on these digital hanging scales the bike is completely suspended and they are accurate ! Only by taking the wheels, tyres and seat off can I get it anyway near 15kg! And then its only half a bike! I wonder if Nazca have stuffed a few kilos of Gouda cheese or some famous Dutch herbal product in my particular frame! Otherwise I agree its a great stable bike and fast on the flat or downhill ,although I am still having issues with the stiffness of the front twist shifters and replacing them with thumb shifters has not been a success. I cycled from Edinburgh to Cambridge on it a few months ago in great comfort , but as the land got flatter into Lincolnshire and beyond , it did feel more at home as one would expect from its Dutch provenance. I got ,and continue to get, great really friendly service and help from David at Laid Back bikes and in no way did he mislead me on the weight issue.He always said it wasn’t the lightest of bikes. What bugs me is simply the disparity between what Nazca’s sheet says (which did influence my decision)and what it actually weighs -even after some £500 of weight reducing components- lighter DT Swiss Shock, Superlight chain and rear cassette and removing the mudguards it is nowhere near 15kg! Oh ,and that I got it to replace my rather ponderous Street Machine GTe,only to find that the Fuego actually weighs slightly more ! I would love to see a website that listed the actual weights of bikes set up ready to ride with typical components i.e with pedals ,wheels,tyres, chain and seat. If it also indicated which components were used, then one could work out if any worthwhile savings could be made with substitutions.It would be a great resource for prospective purchasers instead of the fictions put out by most manufacturers. Every time I climb a hill, my legs certainly feel that weight matters! Hmm – maybe I should have a page somewhere with the weights as ridden? Where did you get your scales? I’ve got an old analogue one but its accuracy doesn’t fill me with confidence! For the scales, just use standard bathroom ones. Weigh yourself, weigh yourself holding bike, do maths, have weight! Lacking any kind of scales in the flat I’ll just guess that mine is pretty heavy. However, it’s always going to be heavier than the higher up stickbikes as there’s some bonus metal to bend around the rider. I wonder how well the weight penalty on the climbs is offset by the weight assistance going downhill and the better aerodynamics? Being at heart a child, I’m always going to go with the bike that lets me go fastest downhill. Climbs are something to be endured for that fleeting 70khp-just-off-the-tarmac sensation! I weighed mine by standing on the scales twice to check I registered the same weight each time then picked my bike up. i repeated this to check. A couple of other points. We need to compare apples with apples. A ‘bent may weigh twice what a roadbike weighs but the roadbike is a relatively flimsy, narrowly focused product with little or no luggage capability. Compare it with a bike of similar capabilities, say a suspended expedition quality tourer and the weights are closer. I take the point re manufacturers quoted weights – there simply is no standard. To be fair to Nazca they do say “about” 15kg. well Nazca sort of apologised for being over optimistic on their weights ,but did send me a pic of a large frame sports fuego without pedals or mudguards or seat pad hanging on their scales at 14.8 – ,I sent back one of my sports fuego without pedals or mudguards or seat pad but with lighter DT swiss shock and KMC super light chain and Shimano XTR light weight cassette weighing in at 17.68! ok mine does have the rear rack on -but can that weigh 3KG?Do I have a weirdly obese freak Fuego? If they could get it down to 15kg on the road then it would be a truly fantastic bike- perhaps making the front part of the frame in aluminium would do the trick? Although I normally do not post or reply to the various recumbent blogs, this time I feel I have to. Regarding the listed weights in our specification of the Fuego I agreed in a mail with John that these are a bit optimistic because, like most manufacturers do, they are without pedals, seat pad, racks, with double crankset, M seat and M frame. Measured this way the listed 15 kg for a top-sport Fuego will not be far besides the truth, for the all-round version with mudguards etc we have listed 18 kg. – kickstand with bolts – 215 gr. – wider/heavier tyres and inner tubes compared to Stelvio/narrow inner tubes, weight difference approx. 350 gr. – mirror – 80 gr? – extra mud guards (plastic boards) – 200-300 gr? – bottle holder – 80 gr? – since a few years our seats have become approx 200-300 gr heavier to make them lasting for heavier customers and loaded travel, also L seats are heavier than M.
– since some years we apply an extra layer of coating to our frames, approx 60 gr extra. The total of the above items is more than 3000 gr and would explain the difference between John’s Fuego and mine. I do not agree with the statement that the climbing performance is affected disproportionally with 4 kg extra weight, I will take my own situation as an example. When I travel with camping equipment (the sort of trip the large travel rack is meant for), my rather lightweight Gaucho 28 highracer has a ready to go weight of 16 kg. I know that my luggage will total approx. 20 kg and my own weight will be 70 kg. With a total of 16+20+70 = 106 kg I can manage approx. 7 km/h on a 8% slope. Would my bike be 4 kg heavier, the total would be 110 kg. My resulting speed would then be 106/110 times 7km/h = 6.75 km/h, approx. 4% slower. To win a race 4% less speed is unacceptable, to travel in comfort with luggage it could mean a couple of minutes in a day at most. Also bringing the Kindshock air shock weight down from 255 gr to even less is not something I would advise for a travel bike, for a loaded tourer better accept 300 grams extra for a steel spring shock that can hardly fail than having an ultra light air shock that can (with an additional air pump to carry). Although I do agree that every kg bike-weight counts when climbing, after many long bike travels I have come to the conclusion that it is far more important that a loaded bike can descend safely with predictable handling than it is to climb up a few percent quicker. We get many reports from customers that happily report very high speeds measured during their holidays, as a manufacturer I do not wish to take any chances here by reducing the weight of the frame, racks etc. Safety, handling and durability first here. Thanks for taking the time to explain the weight implications for the differences in set up – I had no idea all these apparently minor bibs and bobs could add up to 3 KG! Aluminium frame and carbon front fork perhaps would do the trick. I also take the point that reducing weight can increase other problems- I installed a super light and super expensive KMC chain to save about 250 grams , but it just will not shift correctly at the front ( lands on top of or between rings)I do have Q rings installed but had no problems with the standard Shimano chain and expert opinion (Bike Works)has told me its in the detail of the chain design. So just have to build up the leg muscles ,or since David said it was easy to ride one-handed ,perhaps I could get an arm lopped off and save some weight that way! It’s probably worth pointing out that the seat pad and pedals will be quite a significant weight: my Ventisit pad is 440 grams while a pair of M474 SPD pedals is 470 grams the pair – so that’s 900g for those two items right there. You could argue that pedals and pad should be included in the quoted weight, but I guess that can’t happen until all manufacturers follow suit, since it’s probably better that the weights are comparable rather than accurate (you won’t see an upright bike quoted with pedals included, usually they’re also measured pedal-free). Going for a lighter foam pad, light pedals and swapping touring shoes (if applicable) for road-style plastic shoes with two-hole as well as three-hole fitting will enable the loss of quite a bit of weight (about half a kilo if I recall correctly). As the trackback indicates, I cross-referenced this discussion with a breakdown of the weight of all the parts of my Raptobike Lowracer as of a few years ago. Might be interesting, who knows? What an interesting discussion! Henk’s contribution was very illuminating. Last week our much postponed summer arrived. So I dressed the bike in its ‘summer clothes’ for the first time i.e. removed mudguards and fitted 28mm Duranos. The bike certainly feels more lively – I suspect reducing weight at the wheel rim helps acceleration. Ready for the road (all the accessories listed above) it now weighs 15.6 kgs. So with an SL chain, compact double and foam pad in place of the Ventisit I reckon it will go close to 15kg. However pursuing weight loss beyond this point would mean compromising on strength, versatility etc and, it seems to me, to be simply not worth it. Congratulations on getting her down to15kg- a pretty good weight for a comfortable bike and slim enough to be a pleasant companion on most hills .Just couldn’t get mine down to anywhere near that even with light components (but I didn’t want to sacrifice the racks or Ventisit seat). She felt so good and sprightly that I rather regret rejecting what I took as a matronly German Frau for the Dutch charms of a more nubile semi low racer. Actually I think the Street Machine may be faster overall (for me)as it certainly climbs much better- stiffer frame and perhaps the more upright seat as well as less weight help ,as does a much more direct chain routing.Feel all my power gets to the wheels. 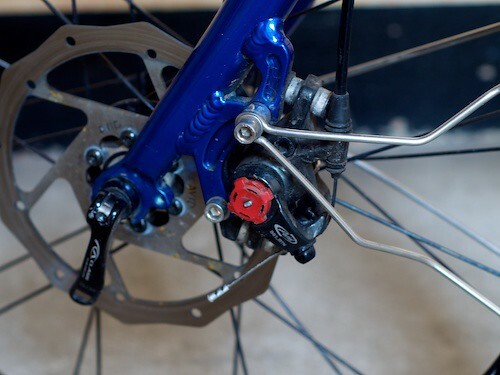 Also I find I can pull much more on the pedals as well as push- maybe something to do with bottom bracket height relative to seat.Solid underseat steerers can also act as useful levers for pulling/pushing against and it doesn’t seem to induce the wobbles. Fuego feels faster as you are lower – but actually I seem to be faster on the SM on equivalent roads when I look at the speedo. I wonder if the aerodynamic advantage of being low down makes much difference out of the velodrome. Also the more reassuring stability of the SM seems to stop me reaching for the brakes when downhill speeds get hairy. As this is a Fuego page, I had better stop nattering about the Street Machine- perhaps Dave would like to borrow it sometime to do an interesting comparative review. In the meantime I am returning to my Teutonic señora and particularly enjoying her ever so relaxing underseat steering. Will she forgive my expensive fling with the Dutch señorita? It was just a recumbent midlife crisis but I think she may be looking to tempt another body to recline on her curves. I really need to start working on my arms, too. I have read already your “ast, efficient, practical. A lowracer for daily use and big trips alike.” this post. This post is very helpful for us. I have gotten more information and experience form this post. Its help me. Upside of the medium is that your feet are well out of front wheel zone and it still is spacious enough to feel good. FYI: the “Quick Adjust” rollover graphic get stuck when you roll over it (i.e., doesn’t roll back). Have to admit I never really “rated” the Fuego, and for foolish aesthetic reasons relating to the metal plates where all the “adjustment” happens. However having ridden one over the weekend, I’d have to say I feel it’s far superior to the HPV Grasshopper I currently ride! (Okay, maybe the Grasshopper gets the nod for ultimate touring ability if you’ve got both racks fitted?) However I suspect for most the Fuego would do everything they’d want from a Grasshopper, and do it faster too? Having owned a Fuego (with Rohloff) for a year now, I have to concur with Alistair that it’s not a Grasshopper replacement. Not so much from a ‘big tour’ viewpoint – these guys showed it works there http://mccraw.co.uk/trans-canada-charity-ride/ – but from a general utility point of view. With it’s shorter wheelbase, the ‘Hopper is far more manouverable (on and off the bike), and the 406 rear wheel means a 20l seat bag (Radical medium or, better, a 30l medium extended) tucks in neatly behind the seat and can eat a fair amount of ‘stuff’. Others have shown that a hugh amount of kit can be attached to a ‘Hopper if needed. I also find that the higher seating position helps with balancing (better viewpoint) when night riding – but maybe that’s just me? Having said all that, the Fuego is clearly faster point to point, which is why mine is still sharing the garage with my 8 year old ‘Hopper (and too many other bikes and trikes, not to mention the ’55 Morris Minor). That yellow Furai that Laidback’s advertising looks nice…. I accept that a ‘hopper may well be able to carry more but more that ability is a good thing only if it is required. Last year I used my Fuego on a three week camping trip through Netherlands, Germany and Denmark. Using a pair of Ortlieb Classic panniers and with the tent on the seat rack I was able to carry everything I needed. If I substituted my Radical throw overs (medium) I could have carried more. The bike acquitted itself very well. Comfortable, stable and not so much as a puncture! And a pair of Radical bags are a lot lighter than four (or even two) Ortliebs. 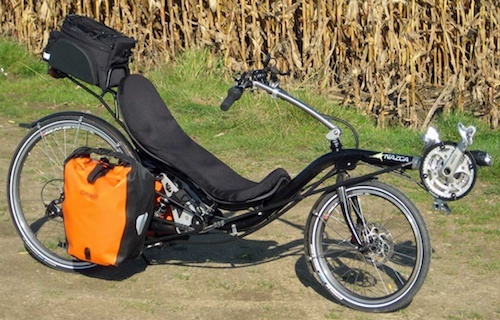 Having gone from the American Linear long wheelbase recumbent to the Fuego, I have to say all these suggestions that it is a ‘heavy bike’ struck me as humorous. It is light as a feather in comparison, even though the Linear is all-aluminum. I put my Nazca on the scales in ‘day ride’ trim eg, with seat pad, lights, bell, mudguards, pedals, Marathon tyres and the small rack. It is the ‘Allround’ model, medium frame, with triple chain set. It came out at exactly 20 kilos. 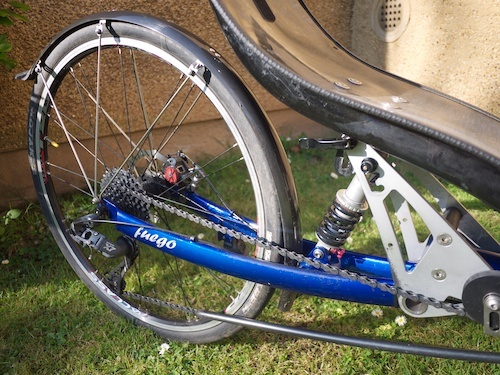 Compared to a DF the fuego has a smaller frame, but a much bigger seat and steerer and twice the amount of chain, which is why it still comes out heavier than say, an equivalent rear suspension DF hybrid. If you are used to stripped down DF road bikes, or even fast tourers, that’s maybe going to seem on the heavy side. 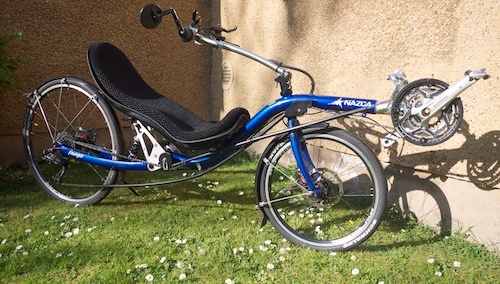 For a dyed in the wool recumbent rider like me, this is a pretty light bike for an ‘allrounder’ and I am delighted with it. I just need the larger seat – anyone need to swap for a medium? 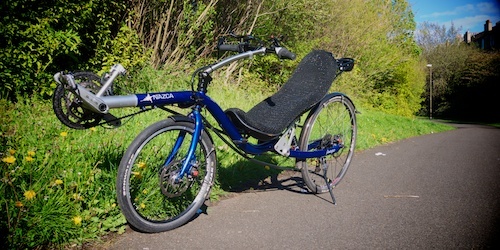 Having now put over 2000 miles on my Fuego bought from Laid Back last July (my first recumbent), I thought I would add my tuppenceworth regarding weight and speed. My experience has been much as Dave has reiterated in many posts and as Henk has said above – weight doesn’t appear to count for much in real terms point to point speed and if you’re not obsessed with saving every second on a long climb I no longer treat it as a primary concern. I have noticed that my times on a light route, a route with a 3KG water bladder in my rack pack and even when I have been to the supermarket and have the banana bags full of shopping adding considerable weight to the bike doesn’t make that much difference to my speed. On very steep climbs I suffer more but I am for example happy to do a 60 mile commute from the Borders to my work (on occasion!) fully laden with bike locks, lots of water / food, clothes, towels etc and I don’t see that much difference. Clearly there is some but it’s not something I have ever detected as being ‘noticeably’ slower. I suspect that the Fuego loses some speed due to the suspension and the frame flex, which is considerable. I have noticed when turbo training that leaning slightly to the side can flex the frame enough to start the rear disc pad rubbing on the rotor. I also notice considerable boom flex when on the turbo. It is however a steel frame and it is super comfy to ride. 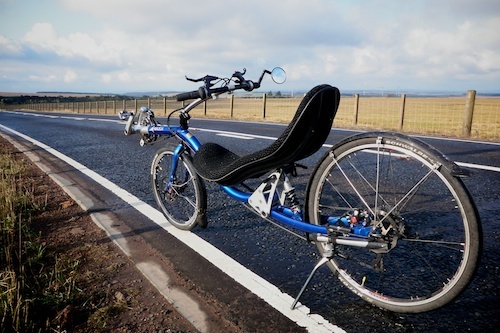 I keep thinking about getting something ‘faster’ but the idea of cycling around any of my local roads on a rigid framed recumbent makes my back recoil, having ploughed this bike through some of Scotland’s finest potholes and marveled at its ability to soak up the pain. Total damage – one snake bite in 2000 miles. 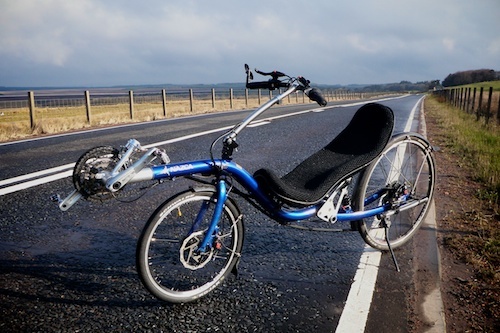 I love this bike, as I discussed with David at Laid Back recently, it’s impossible to find a bike that does everything perfectly, but the Fuego must come close to being the perfect all round recumbent. It’s fast enough without being silly, it is super stable at high speed (I’ve had it up to 48.2 MPH so far and did not feel remotely stressed about anything other than zombie pheasants trying to run under my wheels) and it can carry loads of luggage. I just have the day rack but added medium radical banana bags which are big enough for everything I’ve had to do so far. It feels great to ride (you’re in the bike more than on it), and you can handstand at traffic lights. I have fallen off many times in my learning experience and you hardly have any distance to fall which is a bonus. I have no idea what mine weighs (large version, marathon racers, mirror, kick stand, lights on front and back, rack bag with tools and pump, usually 2-3 litres of water, sometimes I run with indicators), but I can still pootle along at around an average of 14 mph over hilly Borders terrain and that’s improving steadily.